Historical and children's museum, and the colorful story of Belding's past. Open the 1st Sunday of each month. In addition, Saturday and Monday of Labor Day weekend. The Belding Museum is located in the historic Belrockton at 108 Hanover Street. It is a designated Michigan Historical Site. "Spring Into the Past", first Saturday and Sunday of May from 11:00 a.m. to 5:00 p.m.
Labor Day Weekend, open from 1:00 to 4 p.m. on Saturday, Sunday and Monday. Quilt Show, first Sunday of the month from 1:00 to 4:00 p.m. The Classical Revival structure is a museum in itself! It was built in 1906 by the Belding Brothers and Company as a boarding house for the single young women employed in the silk mills. Later the building served as housing for the National Youth Administration during the Depression, and then as a youth center. It now serves as Belding's Community Center. The Belding Museum occupies three floors of the Bel. Thousands of items are on display for your enjoyment! Discover our town's unique past as an international producer of silk thread in the early part of the twentieth century! Trace the development of refrigerators from the first wooden iceboxes. Or perhaps you'd be interested in some of the early medical equipment... like a tonsil extractor? We offer several different programs for all ages and interests. We offer speakers on various topics to the local schools and to groups. Whatever your interests, the Belding Museum has something for you! Spend a while exploring our past! For a glimpse of the Belding of earlier times, let's take a "historical pilgrimage" with Helen Cusack, a former librarian at the Alvah N. Belding Library, who wrote about Belding's past in "Belding's Yesteryear: Pioneer Stories of Our Community." She wrote in 1961, so a few of the landmarks she mentions may have changed over time. Cusack begins the journey at the old Belding cemetery on east M-44, across the highway from Hillcrest Bowling Lanes. "This is the burial place of many of our early settlers. Together with a visit to the Otisco Cemetery, a bit later on in our pilgrimage, you should be able to locate the graves of such early Belding families as Broas, Ellis, Ranney, Belding, Gooding and Wilson." Traveling west on M-44, two blocks beyond the blinker at the Bridge Street intersection is Countryside Floral. "That land and the lovely old home in the midst of tall trees, just west of the greenhouse, was once owned by Levi Broas, Belding's first settler. The first home of Mr. Broas stood somewhere on that property and its owner was responsible for the town's first industry, a sawmill on Flat River." Several of the streets in the area of the original homestead bear the names of Broas' children-Ann, Elizabeth, James, Mary and Charles. Still traveling west on M-44, we cross the Veterans Memorial Bridge. "The hill just beyond the bridge, short and gradual today, was once a higher, steeper one. On the hillside to the right, you may find traces remaining of one of Belding's earliest industries-a brick making yard." A bit farther on, the left, is the Green farm. "This place, an old colonial-type home with an interesting fanlight front door and a Centennial Farm plaque on the lawn, is the site of the first farm in Otisco Township. It was here that Mr. Morse and Mr. Green in 1838 erected a small log cabin. The dwelling was so small that at night what furniture there was had to be moved from the cabin in order to provide sleeping space for the 14 people who shared it." Next is Cooks Corners, settled in 1837. It was named for Rufus R. Cook, who operated a tavern, stagecoach stop and general store in addition to serving as the hamlet's first postmaster. "Older residents tell us that, in the late 1800s, Cooks Corners had a hotel boasting a dance floor anchored upon springs. It bounced gently as you danced and was famous throughout the Central Michigan area." A right turn at Cooks Corners brings us to the Otisco Cemetery, burial place for many Belding pioneers. Turning east, we head for Kiddville, on Long Lake Road. "The ruins of an old dam are all that remain of a town older than Belding. Settled in 1836, it was first named Otisco by James Dickinson who operated a sawmill at that spot. In 1845 the enterprise was sold to J.C. Kidd of Ionia, who surveyed the site of the village named Kiddville. During the lumbering era there was a post office, railway station, general store and sawmill as well as a large boarding house." Near the Arches, an abandoned railroad bridge just south of Kiddville and down the Flat River toward Belding, is a tree-covered island. "The island, known as Cobmossa Isle, was once a camping spot for Chief Cobmossa and his braves. Every spring they camped in the area while gathering sap from the nearby maple trees and boiling it into sugar." The historical pilgrimage ends with a visit to downtown Belding. "Just east of the Main Street bridge is a large factory building known as the Jolly Kid plant, which manufactured children's clothing. It was formerly the Richardson's Mill, Belding's first silk factory started in 1887. It was said that the enterprise was sponsored and financed by the Belding family, but fearing it might be a failure, they chose to call it the Richardson Mill. "Northeast of the factory, on the block behind what was the Belding Locker plant, was the White Swan, or Richardson's boarding house, Belding's first dormitory for women mill workers. 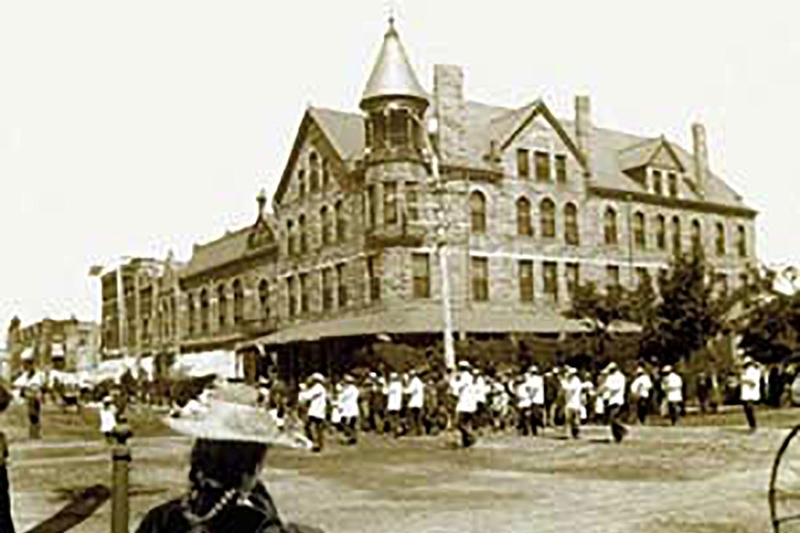 During the years from the 1880s to the 1920s, Belding Brothers were to erect two more dormitories plus several annexes or large rooming houses, for the girls working in the silk mills. The Belrockton on East Main Street (now the home of the Belding Museum) and the Ashfield and Harrison, today a parking area for nearby plants." No trace remains of the boardwalk along the river across from the Belrockton, present site of the Alvah N. Belding Library. "During the Silk Mill period, it was a romantic spot for girls and their beaux to linger until the boom of the town clock sent the girls scurrying to the Belrockton. Like college girls in dorms, 10 o'clock was the deadline on weekday nights." For a longer trip, Cusack looks at other sites in Ionia County. At the Ionia Free Fairgrounds is a plaque erected in honor of Chief Cobmossa. "You will find it on a huge boulder north of the Floral Building. Long before the day of the famed Ionia Free Fair, this park on the banks of the Grand River was the site of a large Indian village and a favorite fishing spot of Cobmossa and his braves. At the very end of Ionia's East Main Street is a farm that was a drill ground and encampment for volunteers during the Civil War. A mile west of Muir, skirted by the Grand Trunk railroad, is a high tree-covered hill. "Before the coming of the white man, the hill, now called Arthursburg, was an Indian stronghold and many battles were fought for its possession." The land lying between Muir and the neighboring village of Lyons once was a favorite camping place for Indians and was a rich source of arrowheads and other artifacts. A mile east of Lyons is a scenic turnout, Green View Point, high above a U-shaped bend of the Grand River. "It was at that place that a bloody Indian battle occurred. A flotilla of battle canoes bearing war-painted Indians, tribes from what is now the Lansing area, gathered to battle Indians of the Grand River valley tribes." 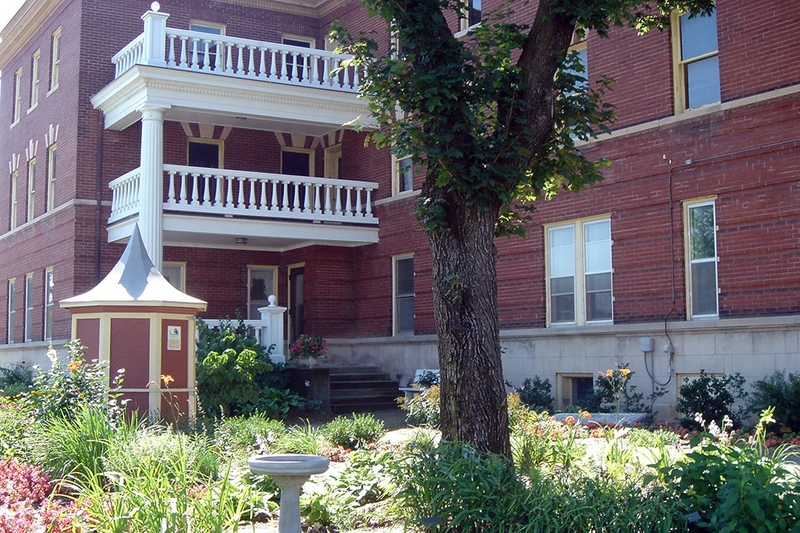 The Belding Museum at the Belrockton Silk Mill Dormitory brings our city's history to life. 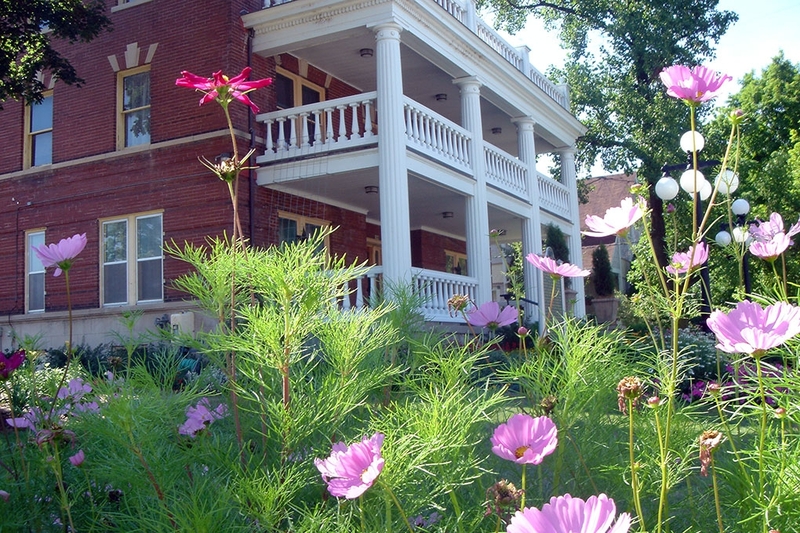 Beautiful gardens surround the Belrockton Museum in Belding. 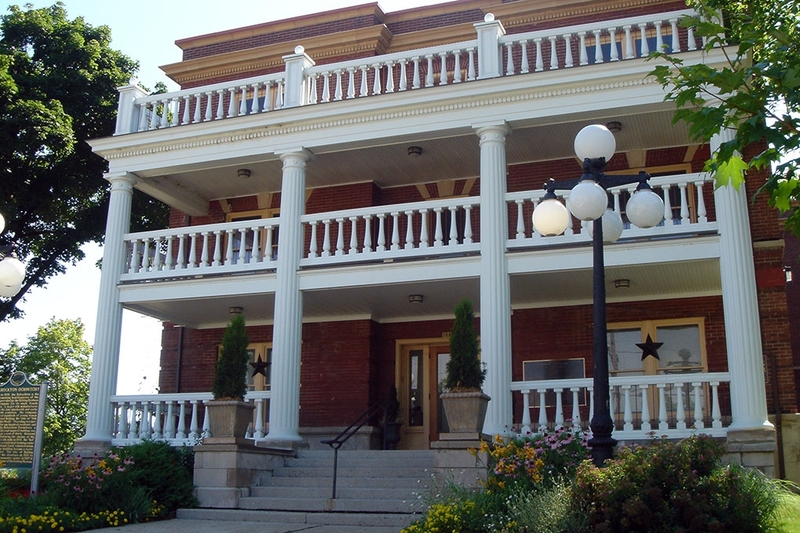 Visit the Belrockton Historical Museum and the Children's Museum. Check this page for Belrockton Museum hours and events. A view of Main Street in 1890. 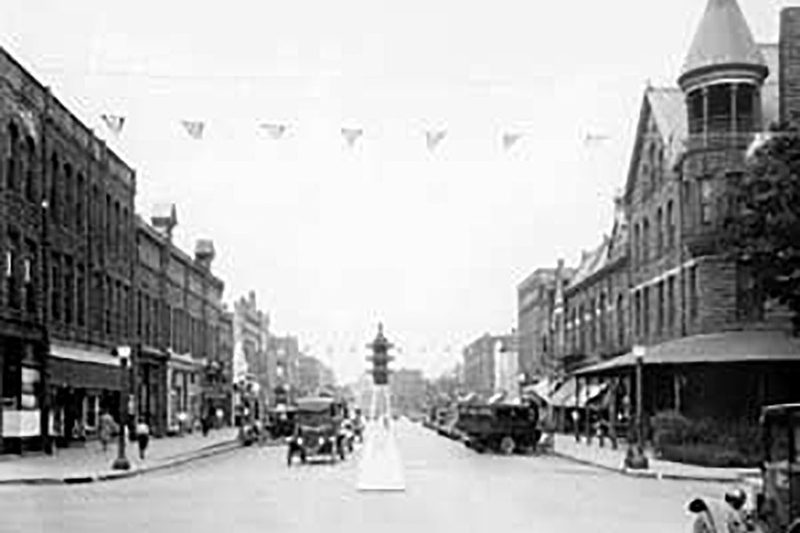 A view of Main Street in 1920. 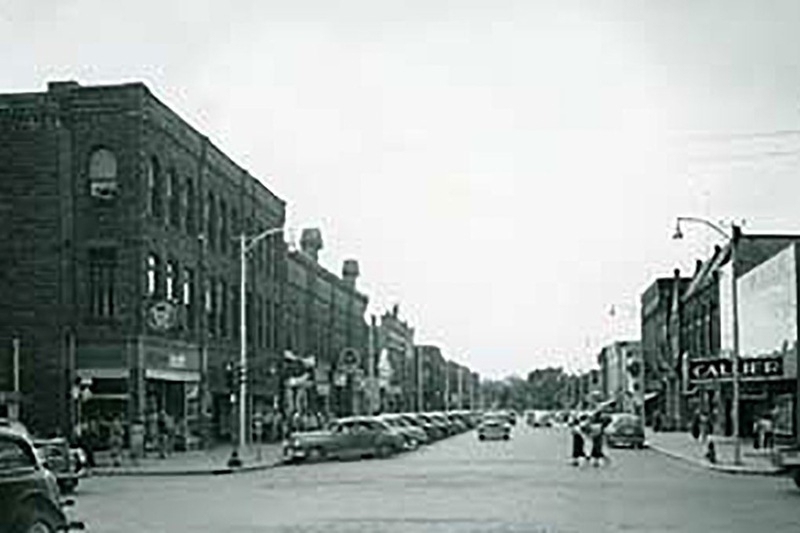 A view of Main Street in 1940. 1st Sunday and Wednesday of each month, 1:00 to 4:00 p.m.
1st Sunday of each month, 1:00 to 4:00 p.m.
Every Wednesday, 1:00 to 4:00 p.m. The Belding Exploration Lab, or the BEL, is a hands-on museum where children may Build, Explore and Learn! Discover the many themes centered around Belding's rich heritage, from flying an airplane to fishing on the Flat River. The BEL is located in the historic Belrockton at 108 Hanover Street. Children must be accompanied by an adult. Admission is by donation. Built In 1906, the Belrockton is the last remaining boarding house of the three provided by the Belding Brothers and Company for its single female workers. A major silk manufacturer during the late nineteenth and early twentieth centuries, the company employed hundreds of young women and earned Belding the title of "Silk City of the World." Providing accommodations for one hundred residents and staff, the Belrockton Dormitory, a Classical Revival-inspired building, was erected at a cost of thirty thousand dollars. Following the closing of the company's silk mills in 1935, the "Bel" served as a residential training center for the National Youth Administration. In 1943 the building became a recreation center. The city of Belding purchased the structure in 1950 to serve as a community center. In 1987 it became the home of the Belding Museum.